When the electricity cuts off unexpectedly, you might be left searching around for a flashlight or a candle. But a bright idea from Shailendra Suman could keep the lights on even when the electricity goes off. The SmartCharge light bulb uses a regular socket and looks a lot like a regular light bulb, but it helps you see for hours after the electricity goes off. 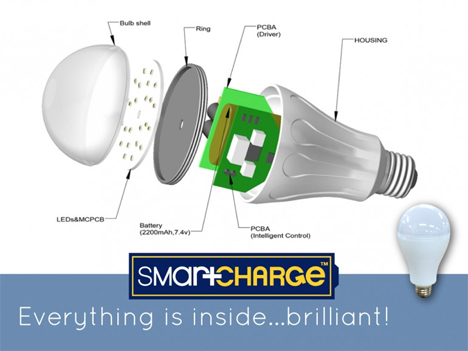 The guts of the SmartCharge bulb includes a little circuit board, battery, CPU, inverter, and control technology to keep it lit even when everyone else’s lights go dark. When the light bulb is screwed in as normal and is lighting the room, the battery is charging. 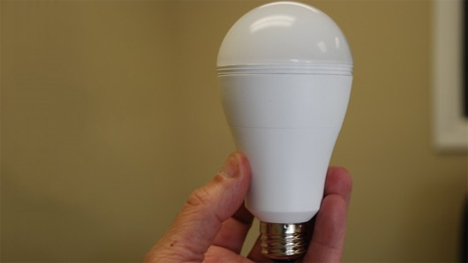 If the electricity does go out, the SmartCharge bulb stays lit with no interruption for up to four hours. While the electricity is out, the charged-up battery keeps the bulb lit – and the light can even be controlled from the wall switch as usual. 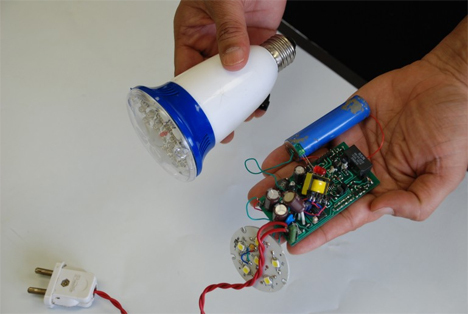 The bulb can sense whether it is drawing power from the grid or from its battery, so even if the rest of the house has no power you can walk into a room, flip the switch and never even notice that the power is out. The project is meant to provide peace of mind, security and safety in a power outage. Even in the worst-case scenario where the electricity it out for more than the light bulb’s four-hour battery life, the bulb will at least give you enough time to find flashlights and other emergency equipment. 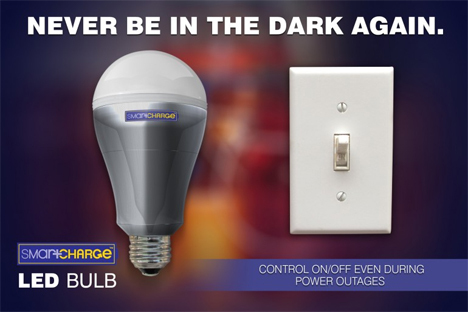 Unfortunately, however, the SmartCharge bulb won’t keep you from having to reset every clock in your house once the power comes back on.